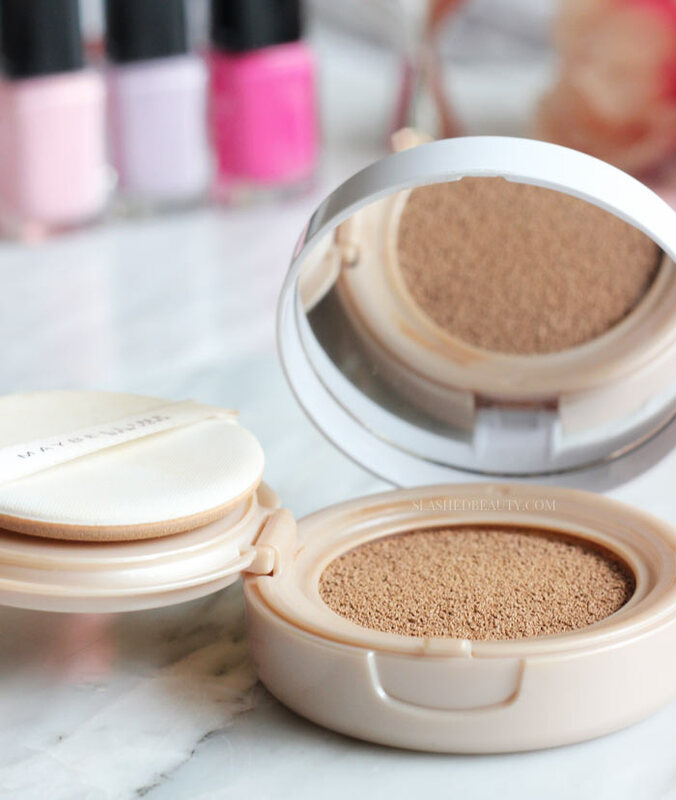 Cushion foundations have gotten uber popular since they’ve made their way to the states in the past couple years, and are finally making a name for themselves on the drugstore scene. 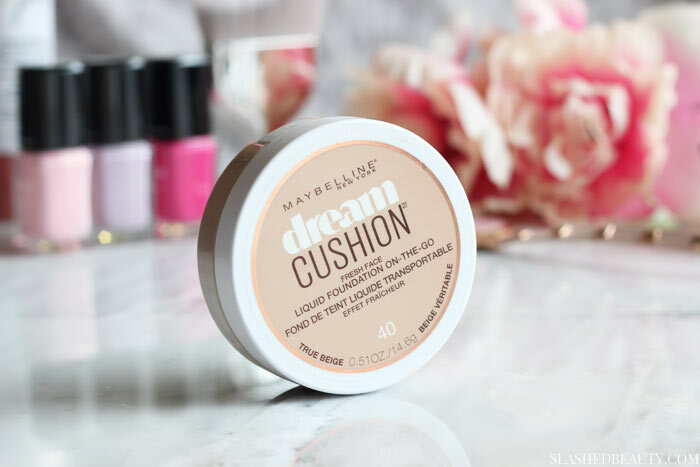 The latest one to hit shelves: the Maybelline Dream Cushion Foundation. The new Dream Cushion Foundation is a “fresh face liquid foundation on-the-go” available in 8 shades that are supposed to offer complete and natural looking coverage. As with all cushion foundations, the liquid is housed in a sponge cushion inside of a compact, which you apply using the included round puff. The puff picks up just the right amount of product to blend onto your skin, and the foundation’s increased color pigments means less is more. While its said to have a luminous finish, I don’t find it dewy in the least bit— more of a natural skin look. I use the shade True Beige which is a pretty close match, just a tad darker than my skin tone. 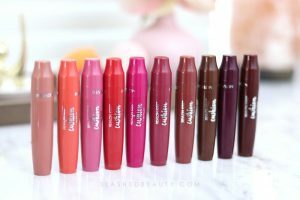 With only 8 shades, it may be hard to find an exact match though they’ve taken good care at including several different undertones. The compact is a good size, and you’re getting a little over half an ounce of product (about half as much as average foundations that come in normal bottles). However, like I said, you’re using a fraction of what you would typical foundations. The included round puff does a great job at applying, spreading and blending the foundation onto the face evenly. In theory, you could probably take a damp beauty blender to the cushion to pick up the product, but you’ll probably be picking up more than you need. The puff helps you work in thin layers to build up where you need it most. The formula is incredibly lightweight, but I was really surprised about how much coverage it delivered. 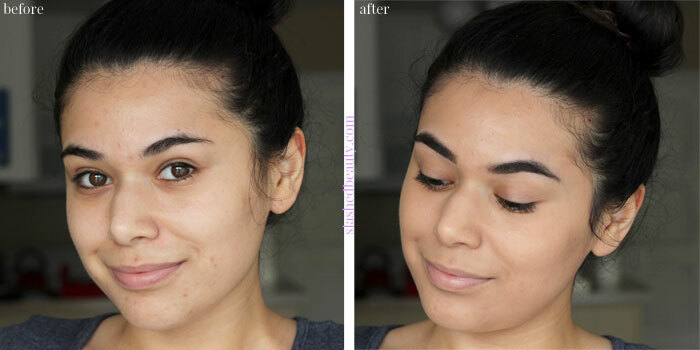 That’s one thing that I’ve had bad luck with in terms of cushion foundations so far: I’ve always had to seriously layer up to cover up my acne spots and scars which defeats the purpose of the product for me. The Dream Cushion Foundation actually puts in work to even out your skin tone without too much need for concealing beforehand. I also find it to have a blurring effect on my pores, especially around my nose. With that said, I find the wear time for this foundation to be around six hours before it starts to fade. My acne starts peeking through around this time, and though it certainly doesn’t look patchy in the slightest, it just wears off… evenly, so I guess that counts for something! It certainly doesn’t look bad when it starts fading, and when my skin is having a clearer day it looks great until I take it off at night. I’ve been reaching for the Maybelline Dream Cushion Foundation more regularly mostly because it’s so convenient to apply. It’s quick, and looks great in a few swipes and pats. Also, because it feels so incredibly lightweight on the skin, it’s great for when I’m not in the mood for a “full face” but want to get lumionus and even skin. You can find the Maybelline Dream Cushion Foundation for $15.99 at Ulta Beauty. It’s a little steep for my taste, especially since— unlike the original concept of cushion foundations— you can’t refill the sponge at a lower cost. 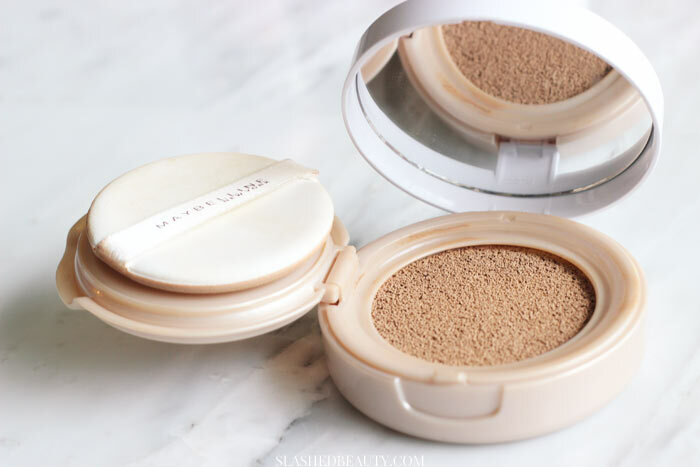 However, this is still the best budget-friendly cushion foundation I’ve tried since the trend hit. 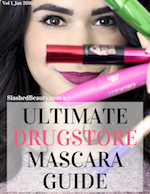 Have you tried any drugstore cushion foundations? Which is your fave? This looks like a bacteria metropolis! It MIGHT work, but for now it looks nasty. You’re not the first one to bring that up, Pam. I don’t know what the companies do to prevent bacteria forming in the cushion. It could simply be a matter of making sure you’re only using it for the recommended shelf life. I really like this cushion foundation. It applies brilliantly and gives me the natural finish that I like. I’m still deciding how I like cushions! The coverage looks great. One thing I’ve noticed about cushion foundations is that, irrespective of the brand, the shade range is poorer than liquid and powder – or cream – foundies. Yes, I’ve definitely noticed that too. Usually the cushion foundations are more expensive than their counterparts even though there’s less product in them. I like them for quick application. This looks like it covers so nicely on you. I agree, though I definitely find myself using less product with them. Coverage has always been my problem with cushion foundations too. I may have to give this one a try. 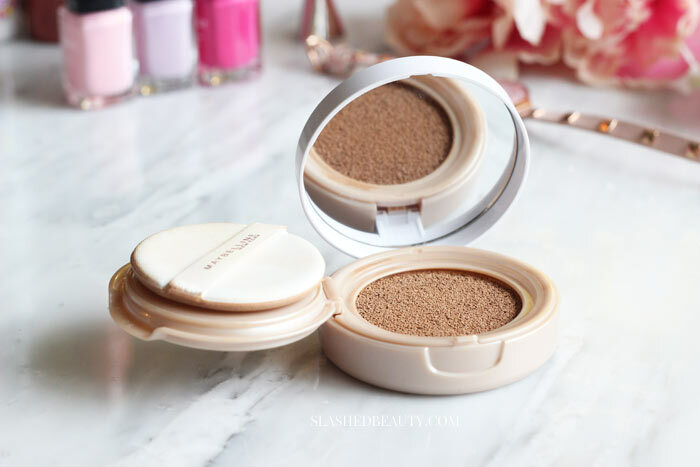 I absolutely love cushion foundations- I find they look flawless and so do you on the pics! Same!!! I usually hate any type of applicator that comes with makeup but this really works! The coverage looks great on you! Thank you! I agree, it was more than I expected!